If US throws Ukraine under the bus, will Moscow reciprocate? Wall Street’s Council on Foreign Relations has issued a major report, alleging that China must be defeated because it threatens to become a bigger power in the world than the U.S. This report, which is titled “Revising U.S. Grand Strategy Toward China,” is introduced by Richard Haass, the CFR’s President, who affirms the report’s view that, “no relationship will matter more when it comes to defining the twenty-first century than the one between the United States and China.” He says that the report he is publishing argues that “strategic rivalry is highly likely if not inevitable between the existing major power of the day and the principal rising power.” Haass says that the authors “also argue that China has not evolved into the ‘responsible stakeholder’ that many in the United States hoped it would.” In other words: “cooperation” with China will probably need to become replaced by, as the report’s authors put it, “intense U.S.-China strategic competition. Haass gives this report his personal imprimatur by saying that it “deserves to become an important part of the debate about U.S. foreign policy and the pivotal U.S.-China relationship.” He acknowledges that some people won’t agree with the views it expresses. The Council on Foreign Relations, as a representative of Wall Street, is concerned only with the dominance of America’s aristocracy. Their new report, about “Revising U.S. Grand Strategy Toward China,” is like a declaration of war by America’s aristocracy, against China’s aristocracy. 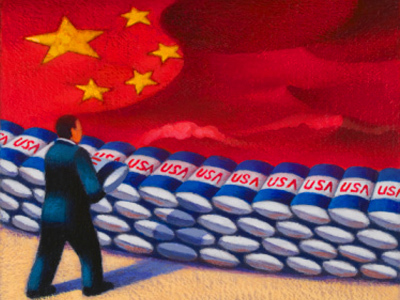 This report has no relationship to the U.S. Constitution, though it advises that the U.S. Government pursue this “Grand Strategy Toward China” irrespective of whether doing that would even be consistent with the U.S. Constitution’s Preamble. The report never allows the matter of America’s “hegemonic control” to be even raised. Thus, “hegemony” is presumed to be evil and to be something that the U.S. must block other nations from having, because there is a “traditional U.S. geopolitical objective of ensuring that this arena remains free of hegemonic control.” In other words: the U.S. isn’t being “hegemonic” by defeating aspiring hegemons. The report offers no term to refer to “hegemony” that’s being practiced by the U.S. The report presents China as being supremacist, such as what (to quote again from the report) “historian Wang Gungwu has described as a ‘principle of superiority’ underwriting Beijing’s ‘long-hallowed tradition of treating foreign countries as all alike but unequal and inferior to China.’ Consistent with this principle, Henry Kissinger, describing the traditional sinocentric system, has correctly noted that China ‘considered itself, in a sense, the sole sovereign government of the world.’” America’s own ‘Manifest Destiny’ or right to regional (if not global) supremacy is not discussed, because supremacism is attributed only to the aristocracies in other countries, not to the aristocracy in this country. Rather than the “general welfare,” this document emphasizes “U.S. Vital National Interests,” which are the interests of America’s aristocrats, the owners of America’s large international corporations. In other words: the Government should spiral upward the U.S. debt even more vertically (which is good for Wall Street), and, in order to enable the increased ‘defense’ expenditures, only ‘defense’ expenditures should be freed from spending-caps. Forget the public, serve the owners of ‘defense’ firms and of the large international corporations who rely on the U.S. military to protect their property abroad. The report says that China would have no reason to object to such policies: “There is no reason why a China that did not seek to overturn the balance of power in Asia should object to the policy preions contained in this report.” Only a “hegemonic” China (such as the report incessantly alleges to exist, while the U.S. itself is not ‘hegemonic’) would object; and, therefore, the U.S. should ignore China’s objections, because they would be, by definition ‘hegemonic.’ Or, in other words: God is on our side, not on theirs. The report’s “Recommendations for U.S. Grand Strategy Toward China” urges Congress to “Deliver on the Trans-Pacific Partnership, … as a geoeconomic answer to growing Chinese economic power and geopolitical coercion in Asia,” but it fails to mention that the Obama Administration has already embodied the authors’ viewpoint and objectives in the TPP, which Obama created, and which cuts China out; it could hardly be a better exemplar of their agenda. The authors, in fact, state the exact opposite: that Obama’s objective in his TPP has instead been merely “as a shot in the arm of a dying Doha Round at the World Trade Organization (WTO).” They even ignore that Obama had cut China out of his proposed TPP. He was saying that these future military leaders will be using guns and bombs to enforce America’s economic dominance. This is the same thing that the CFR report is saying. He made clear that China is “dispensable,” and that the U.S. must stay on top. However, there is a difference between Obama and the CFR on one important thing: Obama sees Russia as the chief country over which the U.S. must dominate militarily, and China as the chief country to dominate economically. But in that regard, he is actually old-line Republican, just like his 2012 opponent Mitt Romney is. The only difference from Romney on that is: Obama wasn’t so foolish as to acknowledge publicly a belief that he shared with Romney but already knew was an unpopular position to take in the general election. Furthermore, whereas the CFR report ignores the public’s welfare, Obama does give lip-service to that as being a matter of concern (just as he gave lip-service to opposing Romney’s assertion that Russia is “our number one geopolitical foe”). After all, he is a ‘Democrat,’ and the authors of the CFR report write instead as if they were presenting a Republican Party campaign document. No ‘Democrat’ can be far-enough to the political right to satisfy Republican operatives. The pretense that they care about the public is therefore far less, because the Republican Party is far more open about its support of, by, and for, the super-rich. Mitt Romney wasn’t the only Republican who had contempt for the lower 47%. But even he tried to deny that he had meant it. In that sense, the CFR’s report is a Republican document, one which, quite simply, doesn’t offer the public the lip-service that Obama does (and which he politically must, in order to retain support even within his own party). Perhaps on account of the CFR report’s condemning Obama for not being sufficiently right-wing — even though he is actually a conservative Republican on all but social issues (where China policy isn’t particularly relevant) — the report has received no mention in the mainstream press, ever since it was originally issued, back in March of this year. For whatever reason, America’s ‘news’ media ignored the report, notwithstanding its importance as an expression of old-style imperialistic thinking that comes from what many consider to be the prime foreign-affairs mouthpiece of America’s aristocracy — the CFR. The report’s first coverage was on 2 May 2015 at the World Socialist Web Site, which briefly paraphrased it but didn’t even link to it. Then, two days later, Stephen Lendman wrote about the CFR report. He briefly paraphrased it and passionately condemned it. He did link to the report. But he didn’t note the WSWS article, which had first informed the public of the CFR report’s existence — an existence which, until the WSWS article, all of America’s ‘press’ had simply ignored. The present article is the first one to quote the CFR report, instead of merely to paraphrase and attack it. The quotations that were selected are ones presenting the report’s main points, so that readers here can see these points stated as they were written, rather than merely as I have interpreted them. My interpretation is in addition to, rather than a substitute for, what the report itself says. » What will the US Treaty of Paris look like? » Too Little, Too Late, will there be a Romanov ending for the Sudairi Seven? » Is Germany losing yet another world war? » Has Merkel Been Abandoned? » Can Afghanistans Economy Rebound in 2017? » If US throws Ukraine under the bus, will Moscow reciprocate? » Did Bayer AG do a Sly Deal on Glyphosate with EU Commission? » Redrawing the Middle East borders: conspirology or real plan? » Will Trump Destroy the Euro? text version © 2006-2019 Inca Group "War and Peace"